The U.S. Patent and Trademark Office on Tuesday granted Apple a patent for switching docking functions, such as data syncing, diagnostics or charging, based on the orientation of a device while laying on an inductive charging pad. Apple's U.S. Patent No. 8,645,604 for "Device orientation based docking functions" describes a method in which a portable device, such as an iPhone or iPad, can change docking behaviors as a function of its orientation with a host device or position on a wireless inductive charging mat. Unlike current Apple docks, which are basically stands with a Lightning plug and breakout line-out jack, the "smart dock" would feature a processor, various input/output interfaces and integrated power supply, among other hardware. Importantly, the dock may have sensors able to determine the physical orientation of a charging device and where it is positioned on the mat. This data, or like data taken from the device itself, can be used to initiate a docking sequence. Mentioned only briefly in the patent are charging techniques, which in most cases refer to charge generation through magnetic resonance. While wired methods are touched upon, the patent's illustrations and various embodiments call for a substantially wireless solution. Illustration of "face-down" device orientation. According to the document, a device's orientation on the charging mat determines what function will be carried out by the system. Examples of different orientations include rotational position, determination of whether the device face-up or face-down, relative position compared to another device and position in alignment with certain coordinates, among others. In one embodiment, a user places a device face-down —display side down —on the mat. In this case, the system would provide inductive charging to the device. Alternatively, when the device is face-up, both data syncing and charging may be performed. During transfer of data, or any other function, a status symbol can be displayed on the device screen to inform the user as to what operation is currently being performed. The orientation can thereby be confirmed or adjusted depending on a user's preference. In some cases, the dock acts as a "conduit" in the transfer of data between a portable device and a host computer. For example, when a device is placed on the mat, data can be uploaded or downloaded to a host computer via wireless or wired communications protocols. 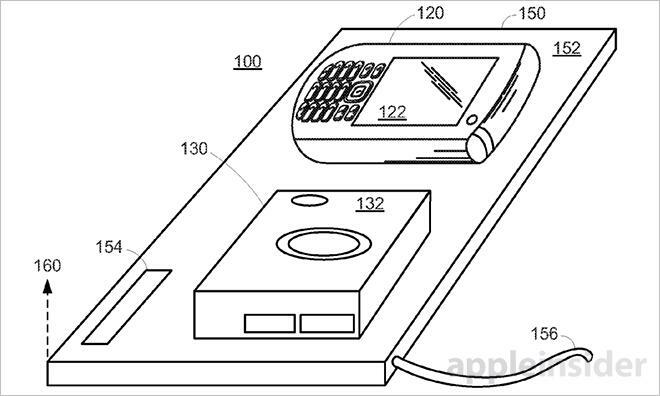 Interestingly, the patent also mentions that the charging surface may be built into a host device like a laptop computer. This particular implementation would be well suited to charging smaller electronics like iPhones and the much-rumored "iWatch." A recent report from The New York Times claimed Apple is actively working on an inductive charging method for the smartwatch, though no hard evidence relating to the product has surfaced. 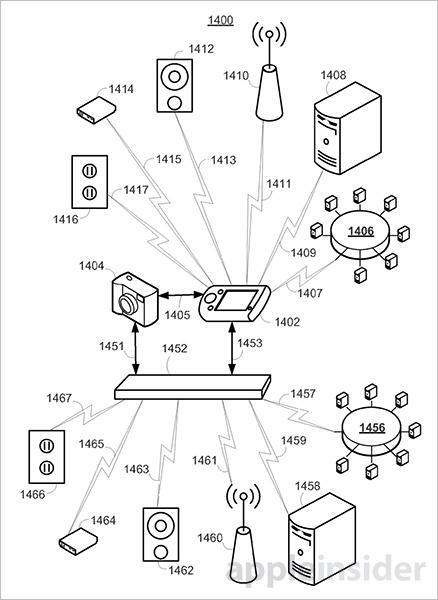 While most of the document discusses single-device usage, the invention can support multiple portables as seen in the patent illustrations. As described, two or more portables can be placed on the mat simultaneously for charging. Further, the method allows for data transfer or other functional operations between the two depending on how they are oriented or positioned on the mat's surface. Apple's invention is an evolution of current docking methods that initiate syncing based on predefined software settings. As with the current implementation, users may elect to sync with iTunes, open iPhoto or simply charge when docking. With the orientation-based docking method, users would be able to select these same functions "on-the-fly" by placing their device on the mat in an appropriate manner. 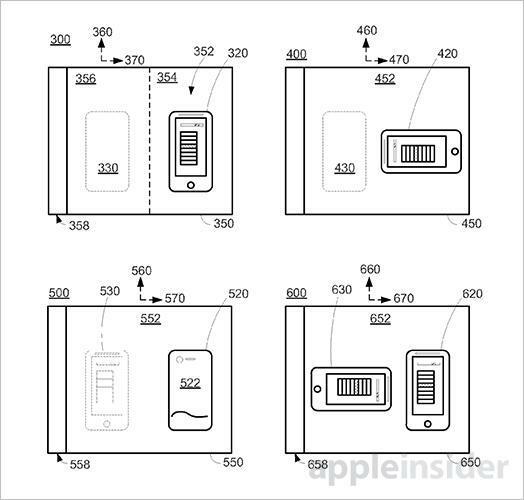 Apple's orientation-based docking patent was first filed for in 2011 and credits Jorge S. Fino as its inventor.